Markelle Fultz isn’t one of those student-athletes who had a fantastic teen record; he was small in size and it shadowed over his skills a great deal. Nonetheless, he was able to earn a handful of recognition for himself in high school and in college. Having a focused mind and an excellent spirit, the youngster was able to get himself picked in the first round of the 2017 NBA Draft by the Philadelphia 76ers. Despite injury challenges that kept him away from most of his games, he has been graded as one of the young superstars to take the place of the likes of Lebron James. Markelle is one of the finest stars in the game of basketball. Even though he is still young, he has made major waves as a b-baller. Born as Markelle N’Gai Fultz on May 29, 1998, this bloke was the number one pick in the 2017 NBA draft by the Philadelphia 76ers. While he’s a playmaker as a point guard, he is equally excellent in his role as a shooting guard. Athletes are amongst the world celebrities and a lot of people are super interested in their affairs ranging from their personal life to details about their family and various endeavors. It is not a different case for Markelle, here are five facts you should know about him. Markelle Fultz was born in Upper Marlboro, Maryland. He is the youngest of two siblings and was raised single-handedly by his mom, Ebony Markelle. His father was never a part of his life, the man left his family to the care of his wife. The b-baller has on several occasions spoken against his dad publicly and has always reminded him that he made it without his help. 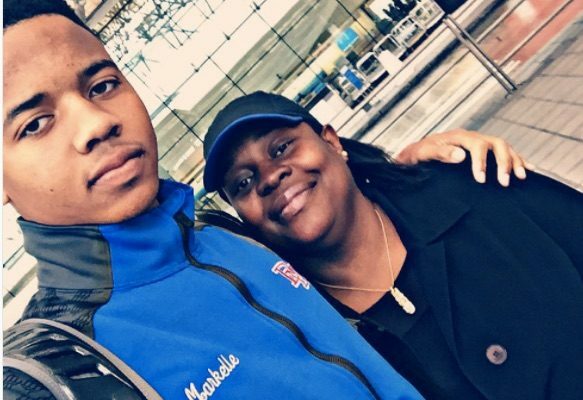 Markelle has also praised his mom for being there all the while for him, making sacrifices in order to give him a better life. He also appreciates her for being his number one fan. The basketballer has also found love, he is currently in a relationship with a lady named Kaila Charles. They have been dating since 2016 and he even went to prom with her; their relationship is heavily publicized. The b-baller developed an interest in the game when he was just 3. He was often seen in the neighborhood with grownups, having fun while watching them play. His dreams of being a b-baller took a form when a certain Keith Williams decided to teach him the tactics behind the game. He started his educational pursuit at DeMatha Catholic High School before proceeding to the University of Washington. Having developed a lot of experience in the game as a child, it was with ease that he attained a successful height while in high school and college. He was neglected as a sophomore in high school due to his stature as he was lanky; Markelle didn’t have a well-balanced weight and was only 5 foot 9 inch tall. Later on, coach Raphael Chillious saw the potential in him and described him as an NBA All-Star caliber player if only he would work on his body build. At the beginning of his junior year, Markelle was 6 feet 3 inches tall and at that point, he became a starter for the DeMatha’s Varsity Team. As a starter, he averaged 16.8 points, 7.9 rebounds, and 4.3 assists, earning the Player of the Year during the Washington Catholic Athletic Conference. With a stature and skill like his, Rivals.com listed him as the 24th basketball athlete in his class. Markelle had over 20 scholarship offers from different colleges but he committed to the Washington Huskies and played excellently with the school team. Markelle Fultz was picked by the Philadelphia 76ers in the 2017 NBA Draft and further sealed a four-year contract with the team. He kicked off his rookie campaign but soon sustained a shoulder injury which kept him away from the court for a while. He resumed in a game against the Denver Nuggets and would later beat the record set by Lonzo Ball to become the youngest player in NBA history to pull off a triple-double. The b-baller has done well for himself and is currently worth $25 million. One of the prerequisites of being an athlete is having a good body build. Markelle Fultz had his limitations in the game as a teen because he was quite lanky, standing at 5 feet 9 inches. He started working hard to improve his body structure and it paid off, he now has a firm and perfect structure. Markelle Fultz currently stands at 6 feet 4 inches and weighs 88 kg.